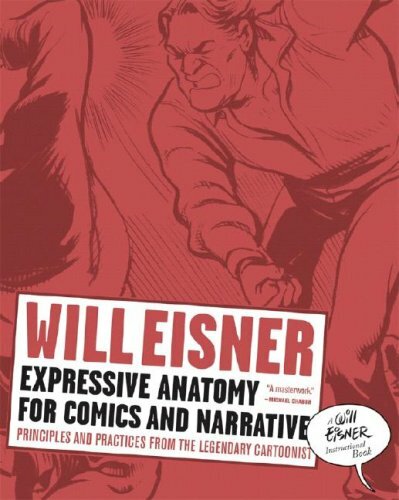 Expressive Anatomy for Comics and Narrative is one of the three Will Eisner instructional books. The other two are Graphic Storytelling and Visual Narrative and Comics and Sequential Art. I bought the book to learn how to pose characters properly and create strong silhouettes. I'm glad to say that this book provides tons of examples selected from Will Eisner's years of comics. Will Eisner started the book but unfortunately passed away in 2005 before he could finish it. Enter Peter Poplaski, an artist who have worked long time beside him. Peter Poplaski was engaged to add the finishing touches for the book with some additional drawings. The majority of art work is still from Will Eisner's archive. The first few chapters explain the anatomy and how it affects movement. It offers a basic introduction to the latter chapters and is definitely not a substitute for an anatomy book. The core concept of the book is actually this: human actions come from reflex and emotions. The bulk of the book is devoted to showing examples of how certain feelings are express through body language and gesture. Each example is clearly explained and exceptionally easy to understand. Even if speech balloons are taken away from the example comic panels, readers will still know how the characters are feeling. Such is the power of a strong silhouette. Included are also many other techniques to help breath life into characters, such as staging, composition, positioning of characters etc. This book is very useful for any artists who wants to create believable characters people can relate to. I think I'll also be getting the other two books. Parka, my brother...yours is my favorite new blog! You feature the best art books, older or new, and it's just good to see them talked about and showcased in the way that you do. That Eisner book is calling my name and the Paul Pope one already called..! Thanks for doing this wonderful work...DON'T STOP!!! I was a bit surprised to see Bridgman's work in the flipthrough video (when timer says 0:20), I assume those were added by Poplaski since they're definetly not Eisner (unless they're Eisner's anatomy copies from Bridgman).